For me as a chef the best of Thailand is the food!. Varied, fresh, fragrant and spicy. It's hard to eat bad food in Thailand, they cook very well everywhere!. From the green papaya salad (unripe) to those warm fish salads. 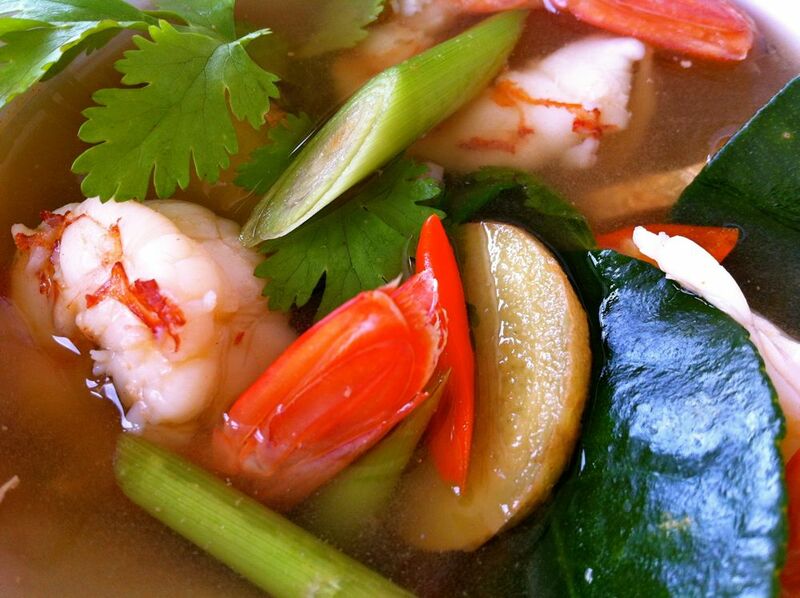 Fantastic soups and complete with: noodles, meat or fish, fresh vegetables and broth. Stews and curries of various types and colors ( see recipe ). The jasmine rice to accompany almost everything, and the sticky rice….. so funny!. Various ways to stir-fry meat and fish where it stands out the concept of "krap phao": a saute ( see recipe ) with a particular basil called "holy basil". A great use of coconut milk and fragrances such as lemongrass and kaffir lime leaves that fully characterize this kitchen. And lets not forget the galangal ginger, the basis of their curry and complement of various soups including the classic "Tom Yam Kung" which we are going to deepen in a moment. Also great eggs and chickens. Masters in cooking the pork (see recipe). Less used the beef and the lamb almost non-existent.Very fresh fish! At the market you can find sea bass and shellfish still alive. All kinds of brochettes, delicious those of marinated pork with a sweetish taste. Many cuttlefish and squid. The shrimp and prawns, have a good pulp but the head is less tasty than those of the Mediterranean. Strange concept of sweets and desserts. Nice those with rice and coconut milk cooked in bamboo. Practically they do not use dairy products. No cheese and less fat!. In fact, overall it looks like a healthier diet than the western's. The fruit is exaggerated ... and so many variety! The mango, among the best along with the longan, mangosteen and rambutan. But even the simple mini bananas and pineapples are very sweet and not comparable to those imported by us. 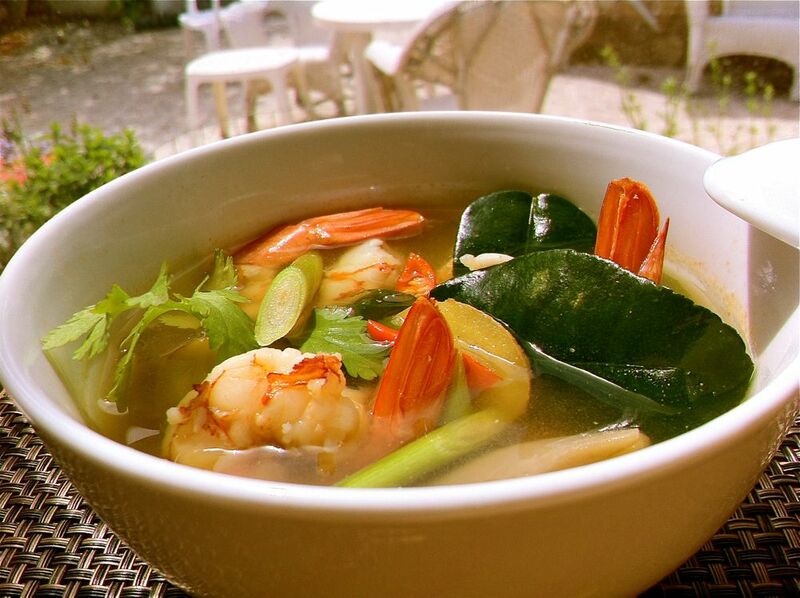 But there is s a particular dish that enclose and represents at it’s best the flavors of Thailand, and this is the soup “Tom Yam Kung”. It looks simple and innocent but then it turns out to be an explosion of scents and a energetic broth. It ‘s the most important national dish, now diffused throughout Asia. Basically an “embassy dish” where with only one taste you will feel all the flavors and peculiarities of this cuisine: spicy, sweet and sour. These last one is given by the squeezed lime juice at the end and it’s that shocking element thats makes you say “wow”. A truly refreshing/invigorating effect that raises the bond between all the flavors. The last element added is the cilantro. And for those who are not much of a fan of cilantro, do not worry, it is not the most used herb. The most used is the basil and there are 3 different types. Clean the prawns, separate the tails and pour the heads and peel in a pot with water, crushed garlic, chilli, shallot in slices, 4 leaves of kaffir lime cut into strips, sliced ginger and the lemongrass cut into pieces. Simmer for 10 to 15 minutes, drain the broth without discarding the pieces of ginger and lemongrass. Bring to a boil again along with the other two leaves of bergamot, the mushrooms and tomato sliced. Seasoning with fish sauce, sugar and half of a squeezed lime. Add the prawn’s tails and turn off after half a minute. Add the coriander and serve. You do not eat the kaffir lime leaves, neither the lemongrass and the ginger, but it is traditional to serve it with. Calibrating the fish sauce for the saltiness and the lime juice is up to your palate. Make sure you can feel the sour of the lime and also the spiciness. 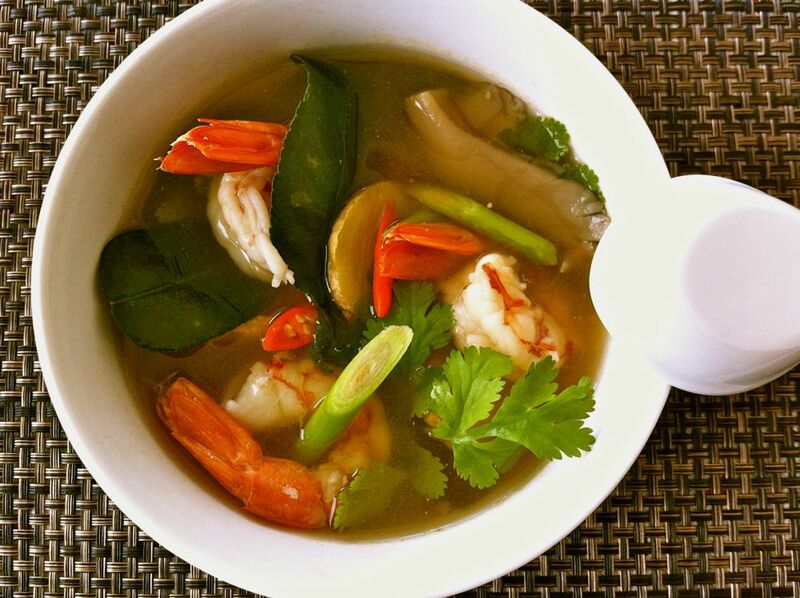 A Tom Yam without chilli is like a beer without foam! ho appena letto il tuo bellissimo articolo su viviconstile. Collaboro anch’io con loro e sono felice di “incontrare” una persona che condivide con me passione per il cibo e, credo di aver intuito bene, anche per l’Asia. Ti seguirò ora che ho scoperto il tuo blog che mi piace molto! Vienimi a trovare e a presto incrociarsi su viviconstile e sui nostri blog. PS ho visto che hai postato la ricetta delle patatas bravas, le adoro e vado subito a “rubarti” la ricetta! Io ho appena visitato il tuo blog! Bello il tuo articolo sulla scuola di cucina a Pechino. Andrei anche io più che volentieri. …Asia addiction!! !